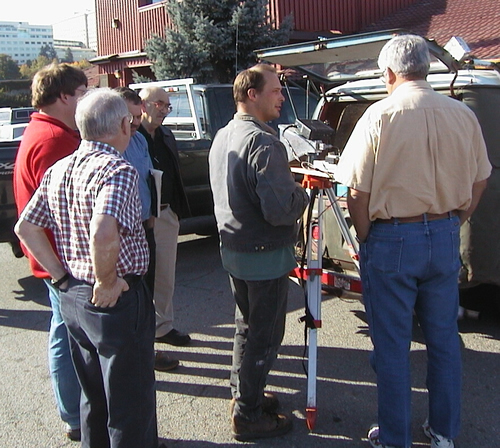 On October 18th, 2003 the denizens of the "Dry Side" gathered at Frankie Doodles in Spokane to resume the Dry Side Breakfasts. We were pleased to be joined by Wet Siders N7CFO, W7DHC + XYL and KB7DQH in that 7th wonder of the world we call the "Enterprise". 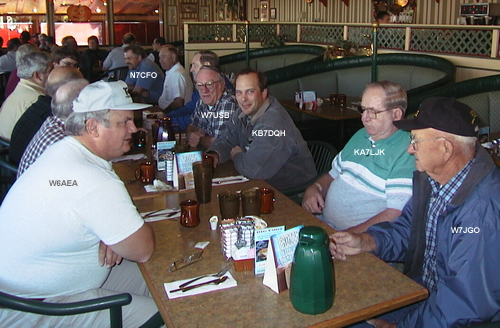 W6LLP's Father-in-Law, KB6DFT travelled up from 6 land as well. 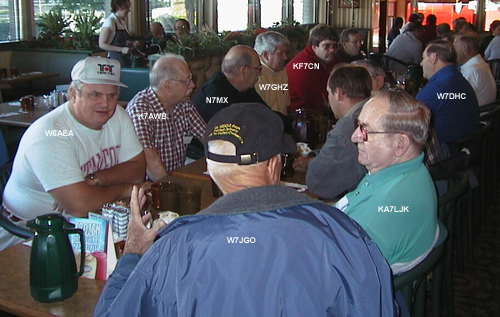 The following pictures were provided by W7DHC and his XYL. Thanks! Every now and then, one of the members on the Wet Side gets the bright idea that it might be fun to wander down and have breakfast at the Poodle Dog. An announcement goes out on the PNWVHFS reflector and hungry weak-signal types begin migrating. 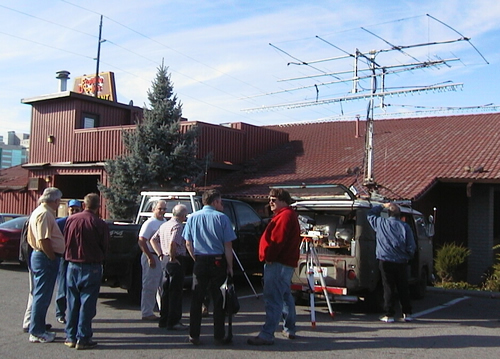 These events typically attract a fair number of the VHF+ crowd. 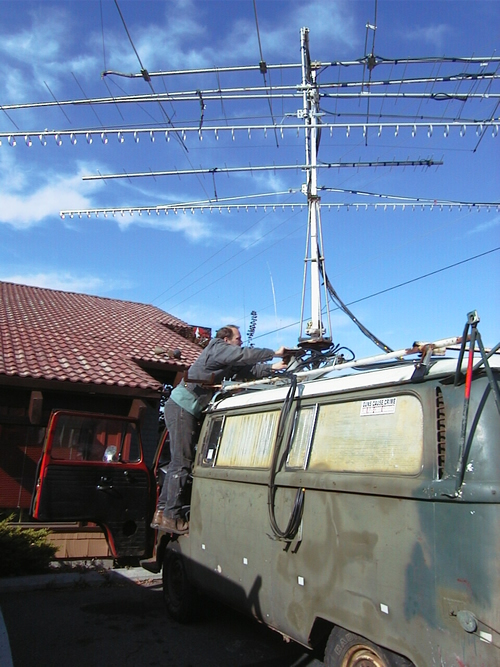 Anyone interested in VHF+ weak signal operation is welcome to join in, young or old, wet behind the ears greenhorn or old timer. Doesn't matter. Come on down and join the group! 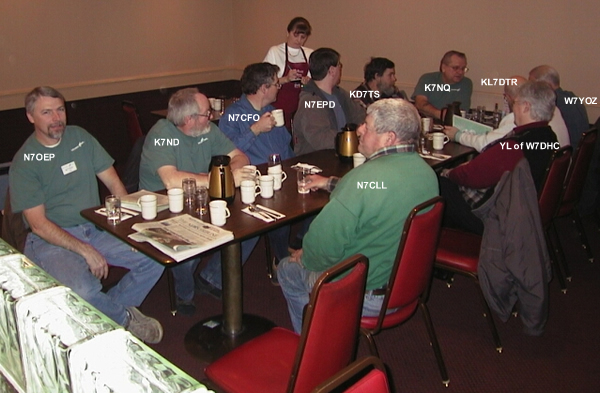 Here is a photo from one of the recent (2003) gatherings. The guilty parties are identified. W7DHC took the photo. Notice all those stylish PNWVHFS T-Shirts!